Progress on the deconstruction of the Memorial Bridge is swift. I left work not expecting to see much different, but sure enough – the south span of the Memorial Bridge had been cut from the approach in Portsmouth and was waiting for its final departure down to a scrap yard outside of Boston. I’m getting more excited to see things change, and to see the new bridge come to life. Much to my surprise, the south tower of the Memorial Bridge was in the process of being dismantled as I drove home for lunch. I grabbed a parking spot quickly, and hopped out in time to grab the “X Marks the Spot” photo above. The various pieces are being piled onto the Sterling Equipment barge as seen below. I love photography, and that sometime’s it’s about capturing a beautiful scene – and others it’s about documenting and capturing a moment in time that stands on its own free of editing, etc. Today’s post is a memorial to the South Tower of the Memorial Bridge, which has since been cut to half its height, and will no longer exist in a matter of hours. The sky on the evening that this particular image was taken was very airy and cloudy, but I decided to give this shot a more somber processing to reflect the tower’s numbered days. Portsmouth is a very interesting place, for many reasons. One of the interesting aspects is how a particular street evolves over time, with an ever-changing list of tenants and various hanging street signs as people move around, close, etc. Commercial Alley is one of the most beautiful nooks in town, and it’s had an influx of new tenants in the past couple years – as you can see by the mostly new hanging signs. The deconstruction of the Memorial Bridge continues as the weather improves, with the massive counterweights as the next step in the process. This was taken on Friday after the process of cutting the counterweights into four pieces had begun, with the first piece already gone, and the remaining 3 chunks from this tower gone as of Monday morning. The red crane against the rich blue sky and the industrial grit of the bridge are just lovely. Can you notice the dent on one of the pieces of the abutment from the counterweight that fell? I love architecture and real estate. This shot was taken from the deck of the new Martingale Wharf building, featuring the brick facade and outdoor patios of what was once the original Martingale structure. Amazing to watch the progress of the building over the past few years, and this new structure undeniably has character. With a nice telephoto lens – it’s amazing what you can capture in a frame from a distance. This shot was taken from the parking lot at City Hall, and has a few layers, giving a nice perspective to the North Church, the I-95 Bridge, the Custom House, and even the parking lot at Citizens. An iconic view with a brooding sky makes for interesting viewing. 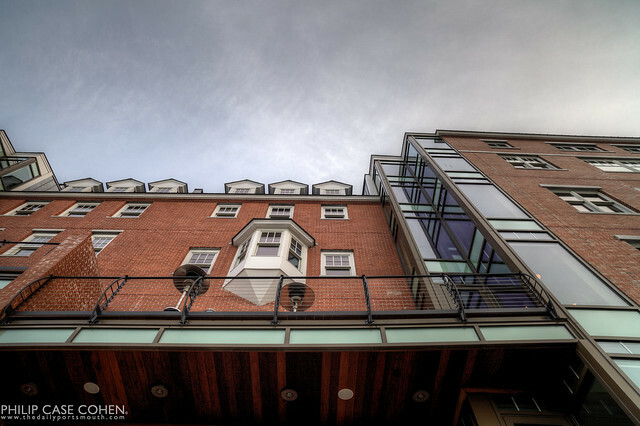 Distinctive Photography of Portsmouth, NH | The Essence of the Seacoast. images appearing on this site.